When I wanted to make my Grand-girls matching dresses, my daughter requested something a little old fashioned and vintage. I looked at so many hundreds of patterns and I just could not find the right look. I follow a sewing blog that I absolutely love called MADE. She designed this pattern and it became available on her blog a couple weeks ago. I knew immediately it was it! It's called the First Day Pattern. It is a downloadable pattern so you get it immediately. It is very simple to sew, her instructions are excellent and the sizing is spot on. I changed it up a little and added piping to the hemline, simply because I love the detail that piping adds. It has a very simple back button and loop closure. I wanted the button to blend in so I used the same fabric and made a covered button. The dress is also fully lined so it makes things like the cap sleeves and back opening very neat and tidy. It's just full enough to give the little girls a good swingy twirl! The fabric is by Fabric Traditions and is in the Heritage Studio Collection. Gorgeous dresses Dori! I also read your daughter's blog and when I saw the pictures of Rosetta in her dress, I had a feeling it looked like your beautiful work. You are such a talented seamstress. 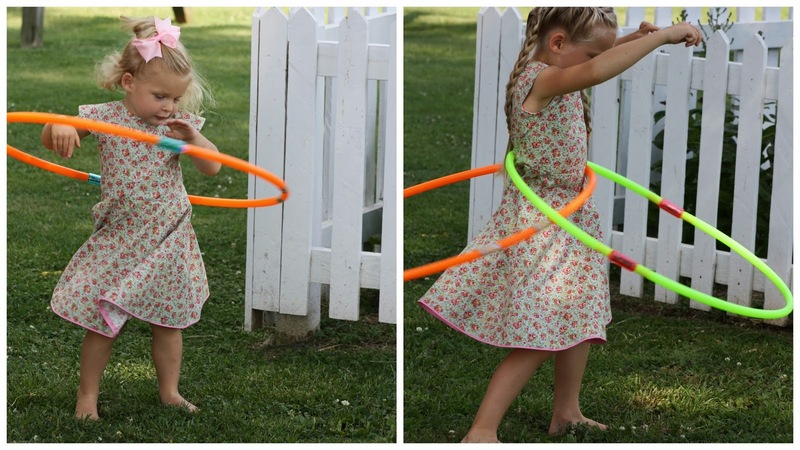 Dori I had a feeling you made the cute dress on your daughters blog too! Wow..you sure can sew so well! Lucky little girls! Very cute!! Love the cute flower stand too! These dresses (and the girls!) are absolutely beautiful! I love the piping on the hem and the fabric that you chose! My grandmother used to make matching dresses for my sister and I from feedsacks, I still have some of them and used them for my girls, and hopefully for grandkids some day. I love piping too! I'm not very good at it though. Yours looks perfect. Sounds like your summer has been amazing...I have loved following you and Andrea too about the Farm Fresh venture. That road side stand makes me happy just looking at it. I wrote you a long email a while ago and hope you got it...all my comments on Blogger get a returned email so I'm not sure what goes through. Please keep posting about the flower business...I wish I could do something like that! How beautiful. the pattern, the fabric, everything. Beautiful job! I've been waiting for MADE to come out with the pattern. I had seen it on her blog and really wanted to make it for my own grandgirls. Yay, I'm going over to find it now. By the way, I really like the look of these dresses and the piping adds a lot of charm. Celebrating 100 and a Giveaway!